It almost seems like a crime not to write about must-try foods in Malaysia considering that I’d gushed about it from day one. When Hali visited me last holiday season (just before our trip to Thailand), I made sure he get to taste the offerings in local eateries near the condo where I live. First of all, here are some of the reasons why I like Malaysian food. One, there’s a huge variety of Malay, Indian and Chinese dishes. Two, if you want to get delicious and authentic local meals, you need not go farther than ordinary eateries and street hawkers. 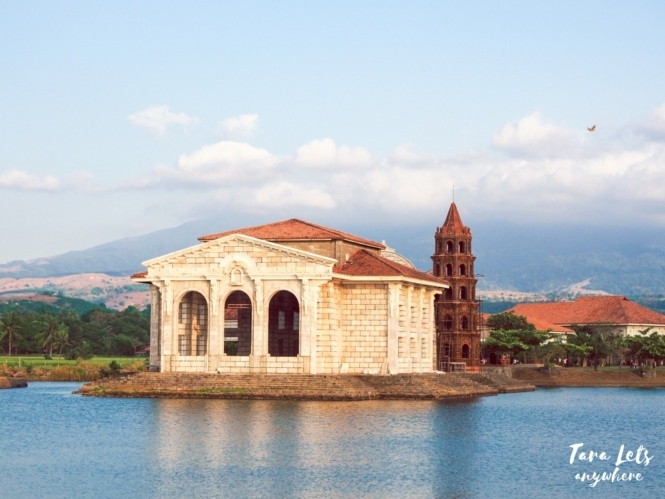 (In the Philippines, if I want to tour someone around, I’d get them to expensive restaurants like Kanin Club or Kuya J because regular turo-turo do not necessarily offer the best Filipino cuisine. You get what you pay for.) Three, most ingredients are made from scratch. Noodle stalls make and cut up their own noodles. Lastly, food is always cooked as you order so you get it fresh and hot. Roti milo and teh tarik. Roti canai is a type of flatbread often served with curry or curries (usually dhal or lentil). There are also variations to this bread, of which my favorites are roti milo (as in Milo, the cocoa brand) and roti telur (roti mixed with egg). You can get a roti canai in mamaks (Indian restaurants that are open 24 hours). My favorite roti canai so far is from Hailam Kopitiam — flaky and buttery, paired with chicken curry. I had my first roti canai here, and it was a great first impression. It has branches all over KL. 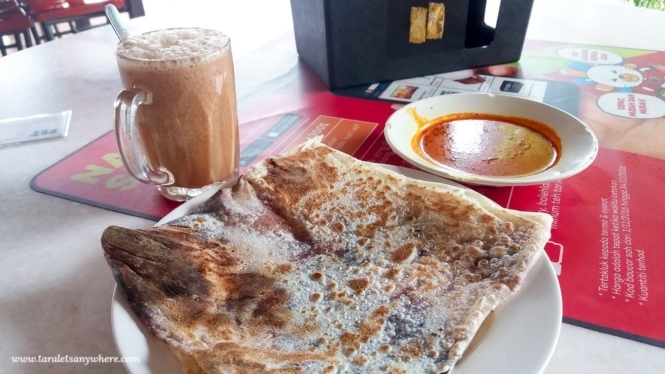 I typically order roti canai as breakfast or comfort food, along with a comforting glass of teh tarik. Regular roti canai costs RM1.20. Traditional cooking with tandoori oven. Tandoor is a type of oven that can reach high cooking temperature. 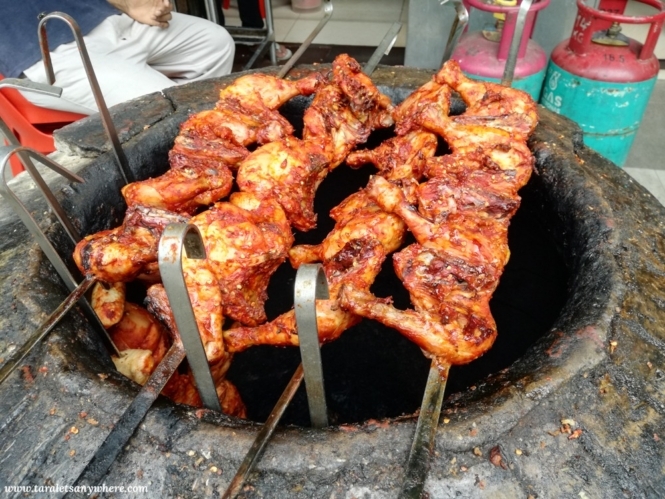 What we call tandoori ayam (chicken) is flavored with yogurt and spices and then cooked in a tandoor. Best eaten with naan (a type of bread) and its accompanying curries. This pair costs RM8 above. 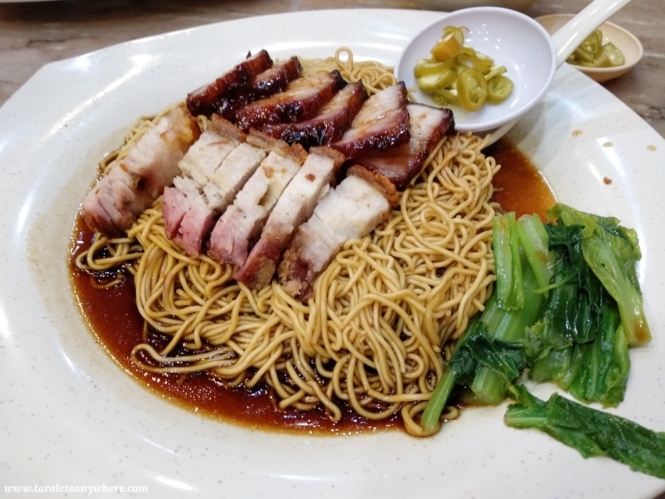 Char siew roasted pork noodles (dry). Char siew is a method of flavoring barbecued pork. This dish consists of thin slices of char siew pork with veggies, tossed in noodles with a flavorful sauce. It is often served with a bowl of clear soup. I’m embarassed to say I usually order a take out so I can mix the soup and noodles together. The sauce’s flavor spreads out evenly in the soup and the dish is more filling. Char siew roasted pork noodles costs RM6 and up. Chee cheong fun with curry sauce. 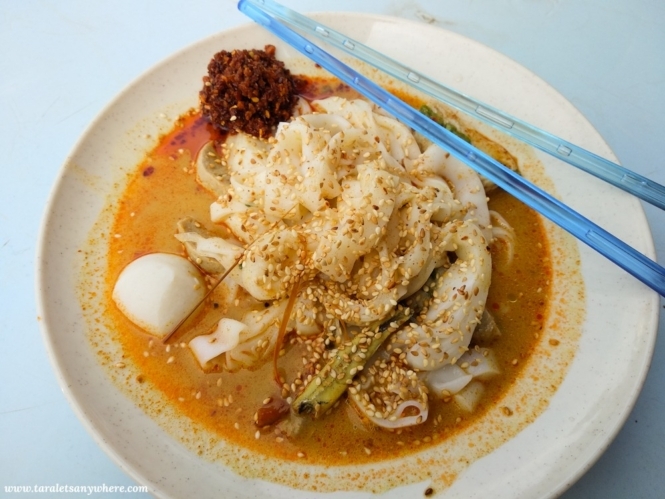 Chee cheong fun is a rice noodle roll in curry or other types of broth. When buying chee cheong fun, you can choose what other items to add: tofu skin, fishballs and even eggplant slices. It is topped with dried shrimps and a bit of chili on the side. Of course, I prefer chee cheong fun in curry. This costs RM5 and above depending on how many items you add. I’d never appreciated duck until I came to Malaysia. I like roasted duck (with crispy skin) served with rice and slices of cucumber and green chili. Or smoked duck in thin slices in a pasta. A rice meal costs RM10 and above. You can also buy a half or whole roasted duck for RM30 and 50, respectively. Also called char kway teow. This is stir-fried flat rice noodles. It is flavored with light and dark soy sauce, chili and belachan (shrimp paste). Bean sprouts and chives are added. 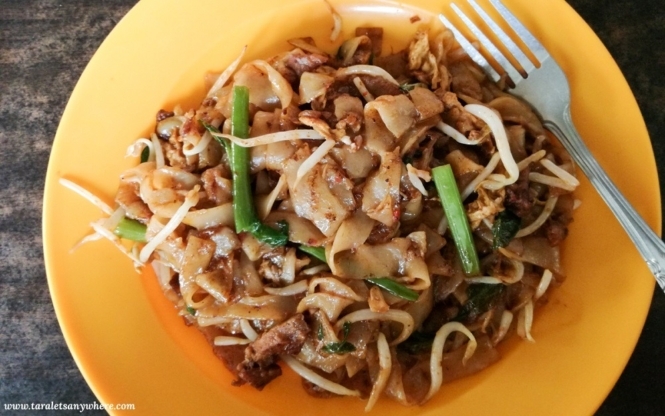 There are variations to char kway teow. The one above is char kway teow daging (beef). Sold for RM6-7 per plate. Chicken, beef and lamb satay. 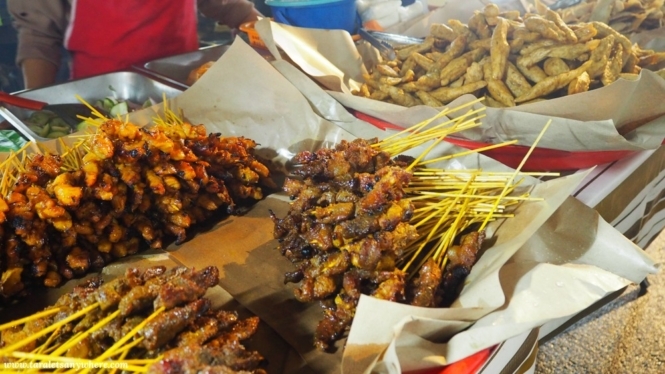 People say that the best chicken satay can be found in Malaysia. These are seasoned chicken slices which are grilled or fried. Served with peanut sauce and/or chili. My favorite is from a food truck near our condo, which opens late in the afternoon. This type of food trucks can be seen elsewhere, and they sold other skewered items for grilling, boiling or frying. You can get one stick of chicken satay for RM3. 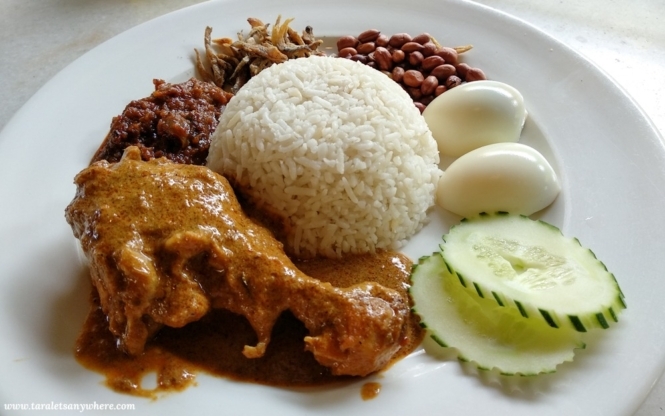 Nasi lemak with rendang chicken. How can I complete this list without Malaysia’s national dish? Nasi lemak is a meal consisting of rice cooked in coconut milk, slices of cucumber, egg, anchovies and sweet chili sauce. It can be eaten with fried or redang chicken or other accompaniments. Accordingly, the rice is more fragrant than regular cooked rice, although I honestly cannot tell the difference. I do, however, love the combinations in this meal and even though it’s not the most impressive, it has grown on me. 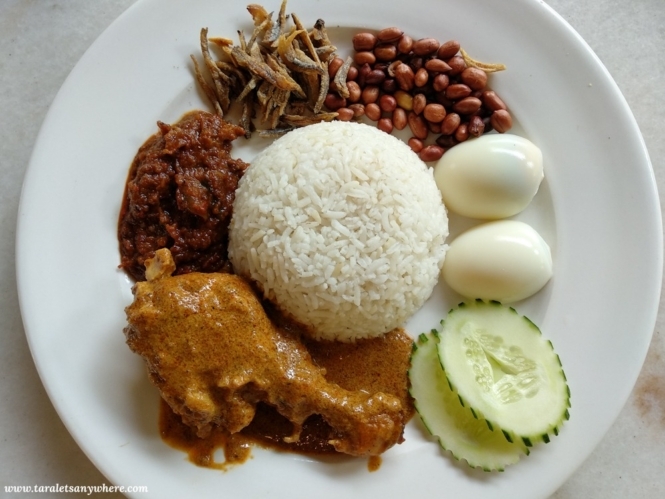 Nasi lemak is sold in most Malaysian eateries for RM5-10, depending on what’s included and how fancy the restaurant is. Briyani (also called biryani) is a type of rice dish. Long-grain rice is used, and it is layered with curry (chicken, kambing or goat, mutton) and vegetables of your choice. Usually served with a pappadum (a crunchy chip). 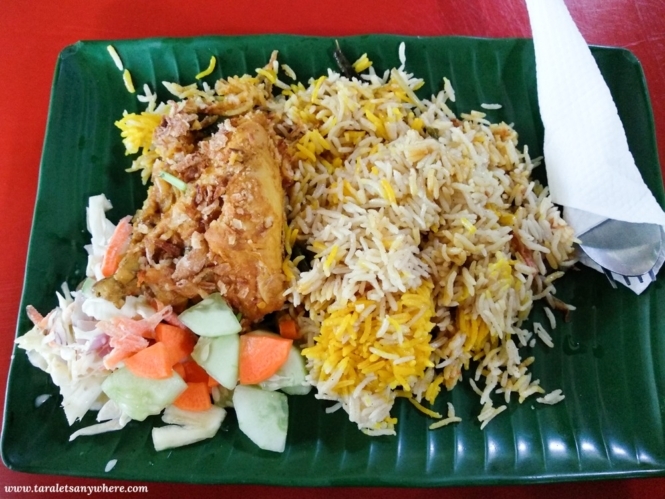 Nasi briyani is a heavy meal and perfect for occasions when you are truly hungry. Price ranges from RM9 to 12. Nasi goreng means fried rice. 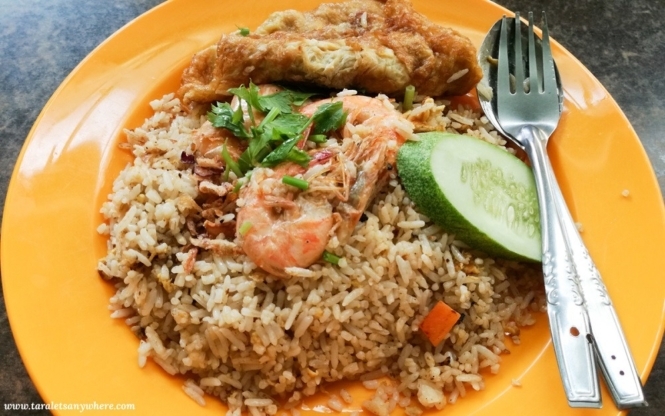 I can’t get enough of nasi goreng udang (shrimp) and would always chow down one with additional fried egg. Take note that serving is almost always good for 2 people (if you’re a guy and have a strong appetite, never mind). Sold for RM6-7 a plate. 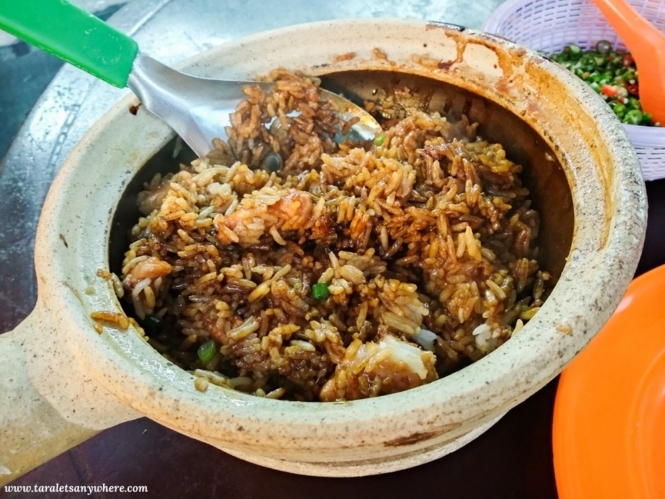 What makes claypot chicken rice so good? Is it the authentic feel of the stoneware and the charcoal pot where it is cooked? The sweet, sticky dark sauce and soft chicken slices? The strong taste of mushroom and lightness of the egg? The fragrant, crispy rice underneath? Ah. It’s impossible to know without trying it for yourself. A regular claypot chicken rice starts at RM8. 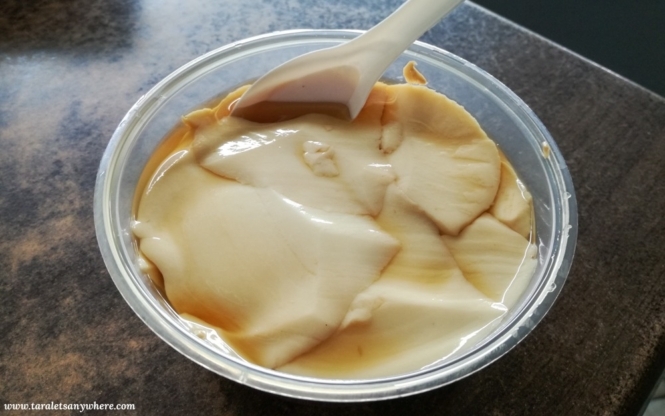 Essentially our own version of taho, this soya dessert is relatively less sweet. It is usually served hot and perfect for mornings or rainy afternoons. Some stalls also offer cold taufufa in different flavors (mango, pandan, chocolate or mixed). Can be bought for RM2.50 and above. For drinks, I usually go for teh tarik (pulled tea) and cham (coffee and tea). You can’t go wrong with this two. Make sure to order them panas (hot). A glass of teh tarik or cham costs anywhere from RM1.50 to 2.50. I also like teh o limau asam boi (lemon or calamansi tea with asam boi) or just limau asam boi (calamansi with asam boi), ordered cold. Price is RM1.50 above. Here’s a handy guide on how to order drinks in Malaysia. There’s a whole lot of dishes I didn’t include either because I don’t get to eat them on a regular basis or I was not able to jot down the name. When I came here, I was crazy about curry but had gotten tired of it after 2 months of bingeing (sorry, not sorry). Nonetheless, I am urging you to try the range of curries in Indian restaurants and savor the mix of spices in each dish. You can also get an Indian thali for RM20. Most Chinese restaurants also offer good food. I like their version of kangkung (kangkong in Filipino), which is flavorful and a bit garlicky, as well as calamares or shrimp breaded with salted egg. To be honest, I don’t think I’ve explored enough of Chinese cuisine… One of the reasons is that I’m staying in the middle of nowhere, with sparse commercial establishments. Other dishes that I think are worth mentioning include Singaporean bee hoon (similar to bihon in the Philippines but mildly flavored) and Cantonese hor fun (vegetable dish with garlicky thick soup), tom yum soup and rendang. Rojak (fruit and vegetable salad) is also good. On the other hand, there are also popular foods that did not appeal to me, hence not included here in case any of you is wondering. Some of these include laksa (asam laksa’s fishy taste reminds me of bagoong… but being in a soup, it is a bit weird), hainanese chicken (a bit bland, but chicken is soft and good when paired with crunchy bean sprouts) and cendol (an iced dessert; the cendol is like sago or pearls that had hardened in the fridge). That saying, a lot of food guides recommend these so you never know if you’ll like them. So, these are my favorite foods in Malaysia! If you’re visiting and would like to explore vegan choices, here’s a vegan guide to Kuala Lumpur. Also, if you’re heading to Malaysia specifically for food, don’t miss out on major food destinations such as Penang and Ipoh. 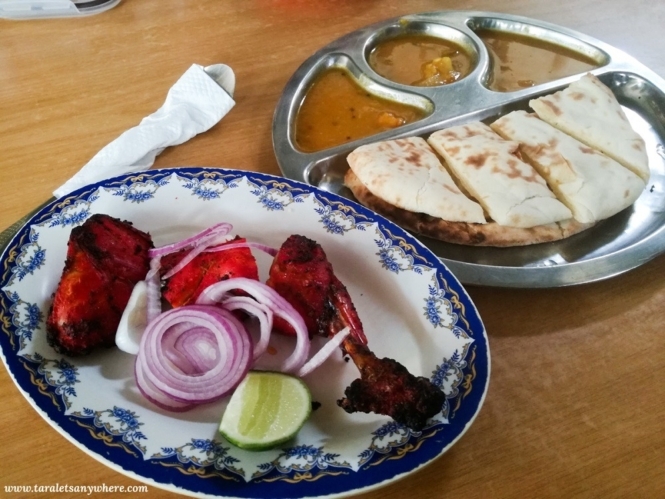 What other food would you recommend when in Malaysia? Let’s hear them in the comments below! If you like this post, save it in Pinterest! Hi there! Please help us keep this article up-to-date. If you have new info about rates, contact details, etc, let us know in the comments section. Also, don’t forget to follow our Facebook Page and Instagram! Thanks!!! 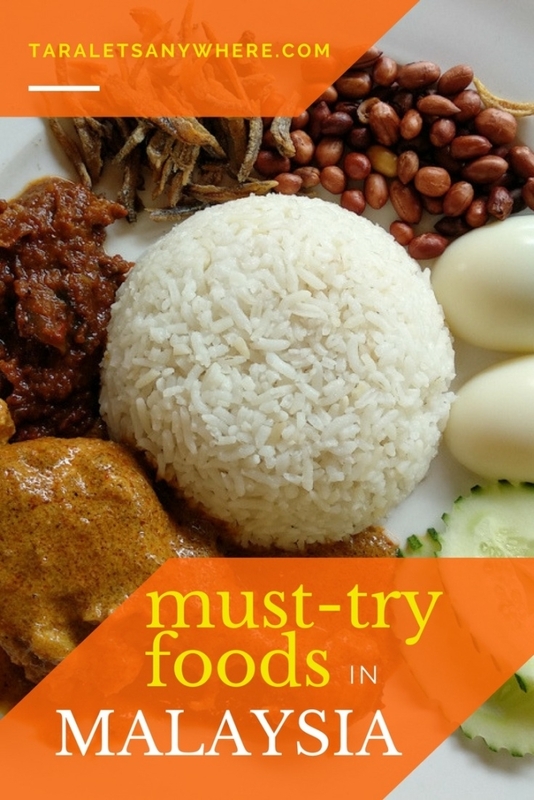 I’ve never had Malaysian food but some of those dishes look so yummy that I can’t wait to try them! How spicy is the food as I can’t do real spicy? My favorite is carrot cake! Did you try it? Oh you mean fried carrot cake? Haven’t tried it yet! 🙂 Will do once I find a store selling them. I used to drink tea tarik every day during my trip to Malaysia. It was sooo good! I have eaten a lot of things there but I don’t remember the names. 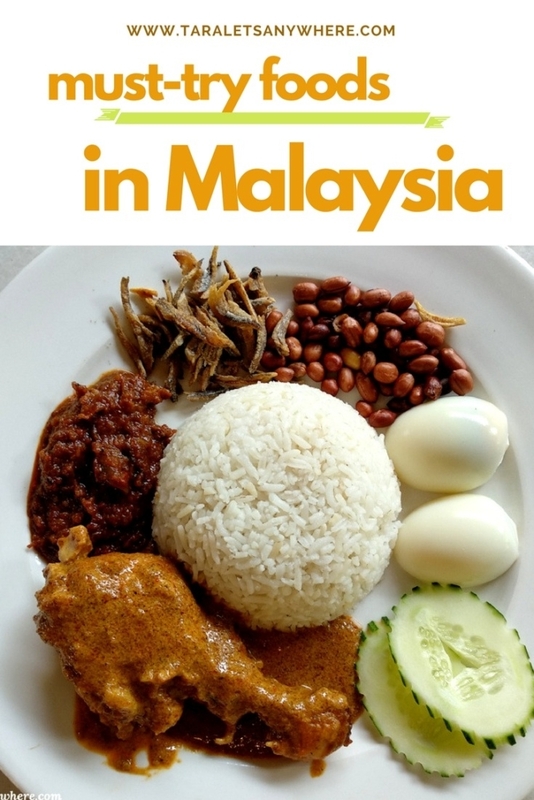 However, I do remember that I didn’t try Nasi Lemak until I boarded the plane back to Europe, as that was our meal… and omg, I so regretted I didn’t had it while in Malaysia, as it tastes delicious, even if it was just a plane meal.